Dave and Lisa's Backyard: I Love Thrift Stores! On the garden front - Dave made a trellis for the raspberries and blackberries, I will post a photo tomorrow, but I had to brag about the thrift store today! 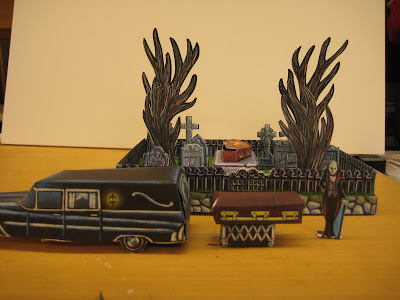 Also, found a very cool website of all things Halloween - and they have a whole section of paper toy templates you can print out on card stock and put together, be still my heart! 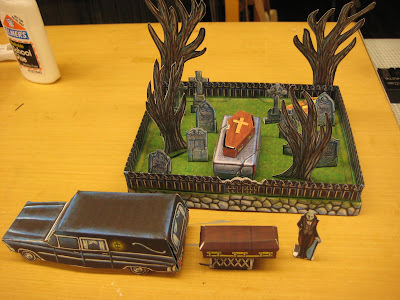 So I made up the Hidden Cemetery and added a Hearse from the Hearse Playset! I have still to make Ravensblight Mannor to go next to the Cemetary and Ohhhhhhhh - I am going to make the Mechanical Bat too!